This week I unpacked my collection of children’s books. In the process, I couldn’t resist opening the covers and turning a page or two. I remembered when my little boys argued over who would sit in my lap and snuggled close so they could see the pictures. A Mother for Choco delighted the busy toddler; Commander Toad made the kindergartener chuckle with delight; The Relatives Came , a simple tale of family and tradition, reminded us all of the people we loved. The kids grew older and selected books about snakes and airplanes. I gravitated to sweet stories where words made music on the page. In those days, books tickled our funny bones and captured our imaginations. Some opened doors to new ideas; others transported us to imaginary lands. The world seemed bigger and more interesting because we read. In honor of the long summer days and my recent trip down memory lane, I’d like to share some of the things our family did to make reading fun. Whether you try one of these suggestions or design your own reading activities, your kids will be more receptive to books when you engage them in new and creative ways. 1. Visit the library often. Investigate the children’s programs and take advantage of reading clubs and everything they offer. 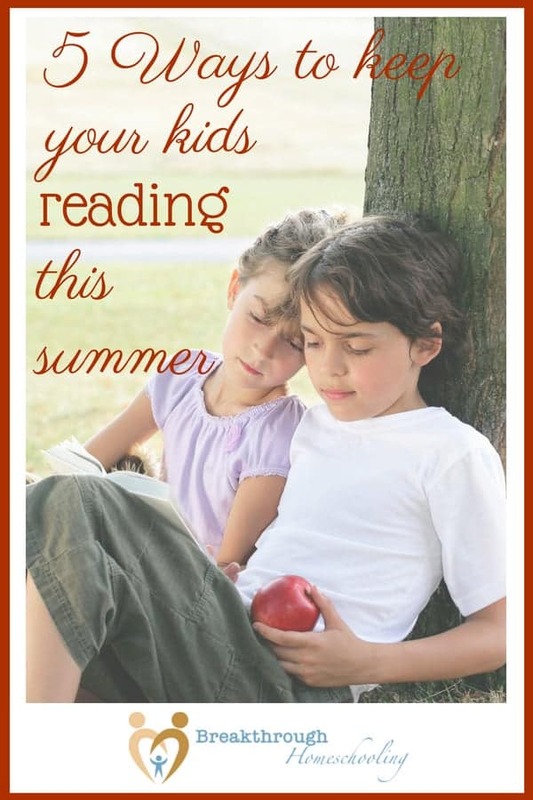 In the summer months, I recorded the titles of the books my kids read (or the titles of the ones I read to them) and offered a reward when they reached a predetermined objective. When they read 50 books we took a “field trip” to a place they wanted to visit. In our case, it always revolved around water and swimming. When they read 100 books we went shopping for a huge water gun blaster or something similar. I didn’t want our rewards to always revolve around material things; however, a fun summer toy was a terrific incentive. If you choose to attach an incentive to reading please remember that your goal isn’t to “police” their performance. Rather, you want to encourage a love of books and reading that will last a lifetime. 2. Take your reading to unexpected places. At night, read in a tent with a flashlight. Even if you don’t want to sleep outdoors it can be fun to share stories and giggles in the dark. Pack a picnic and go to the park. Get a little exercise, polish off the sandwiches, and enjoy a book or two before you head back home. Visit an elderly friend or relative and ask them if they’d like to read the book you brought along to your kids. Take books on vacation. Read in the car or at rest times. Before you leave on your trip, make an effort to find books about the places you will visit. You’ll be amazed at how many writers use beaches, mountains, and grandparents’ houses as settings for their stories. 3. Combine reading and hands-on activities. Read about food and cook a meal together. Read about a farm and visit a farmer’s market. Read about rain and splash in puddles or do a science experiment about the weather. Read about animals and create sock puppets that resemble the main characters. Read fairy tales and build your own castle from cardboard boxes. Of course, you won’t have the time to do this every day but you can probably incorporate an activity into your weekly schedule—especially if you reduce everyone’s screen time in the process. 4. Pursue something of interest. Encourage your kids to select a topic they would like to know more about. Whether it’s robotics or dance, fishing or magic, you can find books written about their particular interest. Help them become “experts” and offer opportunities for them to share what they have learned at mealtimes or with grandparents who will encourage them with praise. Many times I bought books I wanted my boys to read and just added them to the mix on the coffee table. Sooner or later, the kids would pick up the book to read. 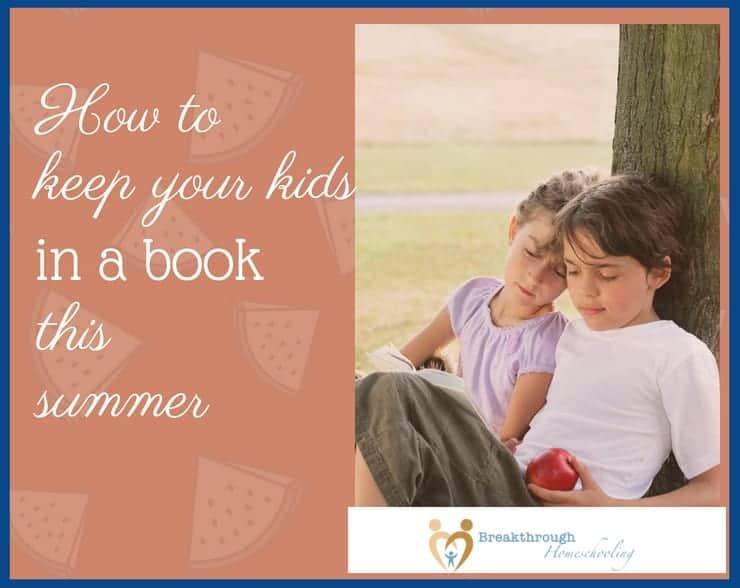 You can also encourage your kids to add a book or two to their backpacks when you leave home for errands. I hope these suggestions don’t sound too much like work. If you make a practice of emphasizing reading in your home, it will become second nature. If you have a young family, I can assure you it’s worth your investment of time and energy to make reading a priority. Like me, you may find yourself handing down clothes and toys but keeping the books to enjoy with the next generation. Of course, you will value the intellectual and creative benefits your kids receive from books, but it is the emotional connection you will celebrate in years to come. ← #breakthrulinkup 32 – Build YOUR (homeschool) Bundle! We need all the tricks we can use to keep reading up during the summer. Love the idea of just setting out some books on the coffee table – so easy! I will need to set up some kind of good reward for 50 books. Thanks for the idea.